So you’re a writer. You’ve just found out about this self publishing thing. Maybe you read Ben’s great blog post from last week so you’re coming at it with reasonable expectations. So what do you write? What genre should you write in? Teen vampire romance? Blood and guts horror? Traditional fantasy? There’s no shortage of advice out there on this subject. Chris Fox has a whole book he will sell you on writing to market. He illustrates to you how to see what hyper specific genre is moving but under fulfilled so you can write and sell, sell, sell, baby. There’s nothing wrong with this, off course. Trust me, I’m all for being a snooty. I spend a week every year on an island discussing craft and I’ve been known to label myself things like (gasp) artist. I’ve been known to use words like muse and have been seen in public drinking tea. But I’ll never stand for condescension or belittling someone else’s path. If that plan works for Chris, awesome. I’m glad he’s having success. But, for now at least, that’s not my strategy. I’d also encourage it to not be yours. Instead, I’m encouraging you to make your Pootie Tang. Ever hear of this guy named Louis C. K.? The Peabody and Emmy winning comedian? Taste is subjective, of course, but he’s pretty widely celebrated in today’s culture as a writer, a comedian, and a director. To me, he’s a genius. Your mileage may very. What’s indisputable, however, is that early in his career he didn’t celebrate the same sort of success. His first major work—his major motion picture writing and directing debut—was the indescribable Pootie Tang. It was a tremendous failure. Adapted from a sketch he wrote for the Chris Rock Show, this movie has a protagonist that only speaks in intelligible jive, wields a mighty belt, and has to discover himself on a farm to acquire the wherewithal to slay an evil fast food corporation. It’s beyond absurd. Most people still don’t get or want to get Pootie Tang. You probably don’t get Pootie Tang. That’s okay. The people that get it…REALLY GET IT and love it because that audience was never before and will never again be served that well. More importantly, in an early stage in his career, Louis C.K. really threw himself out there as an artist. He exposed himself by making art that only he could make, not trying to make the most money by making the art everyone else was making. I’d argue he’s still doing that—it’s just that what he’s had to say and what larger culture has needed to hear has been weirdly instep for the last half decade or so. They’ll drift apart again, I’m sure. It’s already starting to happen. His recent SNL hosting appearance has been highly (and rather unfairly in my opinion) criticized. But that’s okay. He’s really not supposed to be for everybody and he’s never tried to be. He’s always strived to make art that’s come from an honest and pure place. And every year, new people find out about Louis C.K. and the right people—people that would never be his fans anyways—get disgusted or appalled and bounce off. The correct people—those who will be his fans—filter into his whole catalog of work, find Pootie Tang, and love that it exists. This weird, absurd project is finding its people. 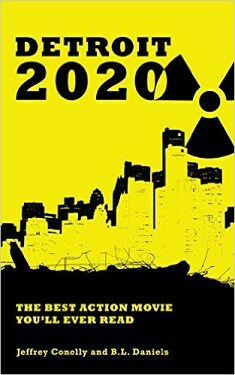 For Ben and I, it was important that Detroit 2020 be the sort of project that only we could write. We had a blast doing it. We were well aware even at the crafting stage that most people reading it would be confused, annoyed, or (probably the case with most of my family) appalled. Even if it sold zero copies the laughs we had in the writing meetings were worth it. Let’s face it, your first products aren’t going to be super successful—statistically speaking—no matter what they are. If you write to market your entire barometer for if those projects are successful is whether or not you can cash in those movie rights and buy a yacht. That’s an exaggeration, obviously, but even moderate success is difficult to achieve in the short term. You’re setting yourself up for disappointment. If you, however, write something that only you can make—that you love and are proud of—then you can pat yourself on the back so long as 1. You grew and learned as a writer and 2. You produced the best thing you could produce at the time. And, hell, there’s nothing saying that you can’t write to market later. Only then you’ll have a few books under your belt and will know how to do it without appearing like a big smelly phony. You’ll know who you are as a writer and how to craft something that’s a bit more sellable, but that’s also very unique to you. And, in time, your Pootie Tang will find the fans it was meant to find.